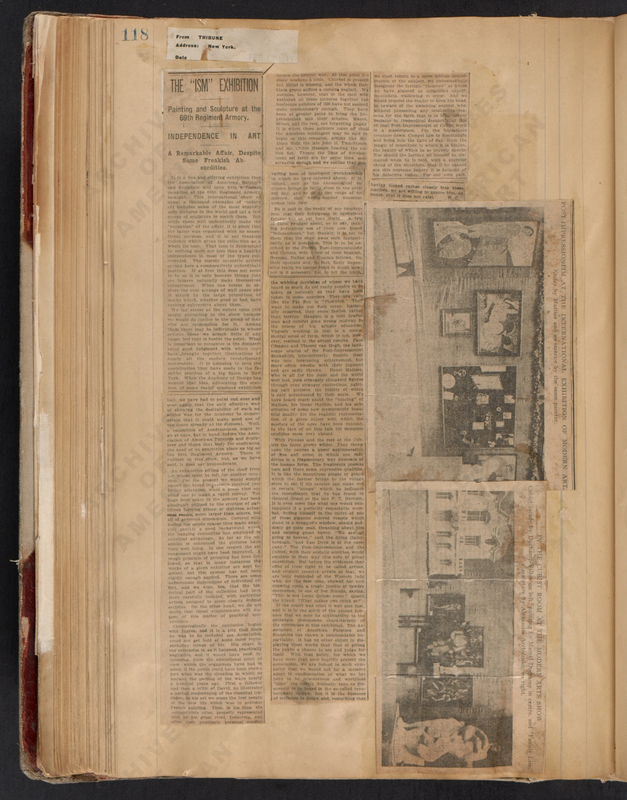 Walt Kuhn scrapbook documenting the Armory Show, 1913. Walt Kuhn, Kuhn family papers, and Armory Show records, Archives of American Art, Smithsonian Institution. As part of the centennial of the International Exhibition of Modern Art, also known as the Armory Show, the Smithsonian's Archives of American Art developed this digital exhibition to make our materials available to a wider public. 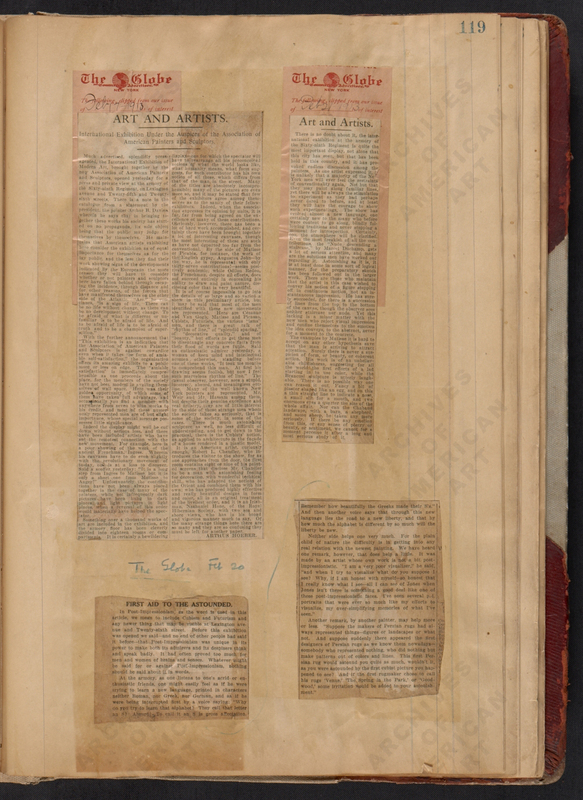 The story of the 1913 Armory Show cannot be told without the Archives of American Art. The Archives holds the largest accumulation of primary source material, ranging from official records produced by the Association of American Painters and Sculptors (AAPS) to the firsthand—and often irreverent—accounts by visitors to the show. Since their discovery in the middle of the last century, these resources have enriched our understanding of the 1913 Armory Show's indelible impact on American art. This exhibition encourages visitors to access digital reproductions of key documents about the show from the Archives' collections. The Archives' holdings document the development of the Armory Show and its critical reception. Many were created by key organizers Arthur B. Davies, Walt Kuhn, Walter Pach, who conceived, organized, and executed the exhibition of approximately 1250 artworks in record time. Related press materials reflect their savvy, professional publicity tactics, which generated enormous amounts of copy both serious and sensational and resulted in outstanding attendance and numerous sales. Artists and critics reacted both in favor and against the Armory Show. Together the letters, sales records, printed ephemera, and personal diaries paint a picture of the Armory Show that is as dynamic as the stunning diversity of works on display. 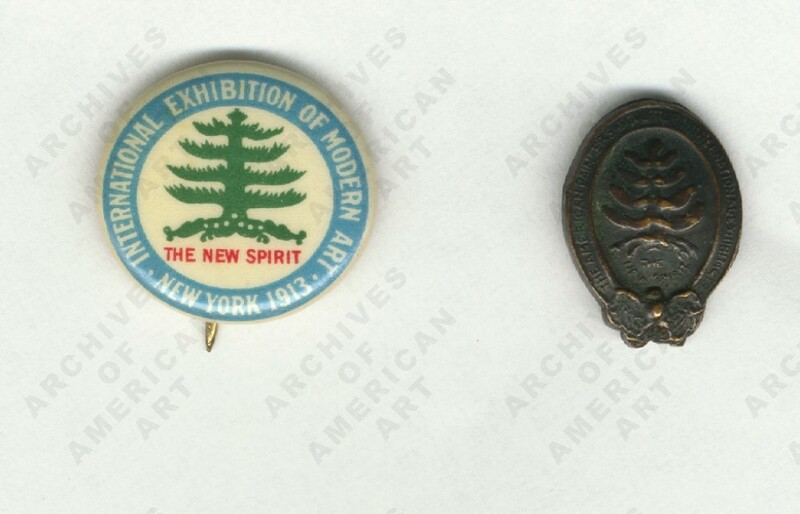 Armory show button and lapel pin, 1913, from the Walt Kuhn, Kuhn family papers, and Armory Show records, Archives of American Art, Smithsonian Institution. The International Exhibition of Modern Art was the first major exhibition of European modern art in the United States. Leaders of AAPS organized the show in New York, New York at the 69th Regiment Armory, from February 17 to March 15, 1913. (Gradually the moniker, the Armory Show supplanted the longer, official title.) It then traveled to the Art Institute of Chicago in Chicago, Illinois from March 24 to April 16, 1913. Finally, the Copley Society of Boston hosted the show at Copley Hall in Boston, Massachusetts from April 28 to May 19, 1913. Organizers boasted that the show would be recognized as "the greatest modern show ever given any where on earth, as far as regards high standard of merit." That we continue to observe anniversaries and study its legacy is a testament to its great significance. Many of the key documents related to the Armory Show may be found in the Walt Kuhn papers and the Walter Pach papers. 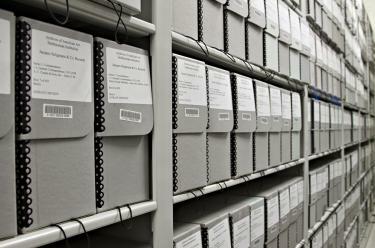 Their papers, now digitized, form part of the Terra Foundation Center for Digital Collections. The Terra Foundation for American Art has funded Archives of American Art's ongoing project to create an unparalleled virtual repository for the study of the visual arts of the United States. A digitization project team–a manager, archivists, curators, digital imaging technicians, and a webmaster–ensures that the Archives remains a vibrant resource for the critical study and appreciation of American art, anticipating and responding to new digital modes of learning, scholarship, curatorship and reference. This web project seeks to engage and familiarize growing audiences worldwide with the Archives' unique holdings. This content was compiled by Dr. Kelly Quinn. Have you ever wanted to see a handful of folders in a collection at the Archives of American Art, but you couldn't find the time to come to our DC reading room? Then the Archives of American Art’s Digitization on Demand service is for YOU! Research and reference services provides help finding, accessing, and using the collections at the Archives of American Art. Original material can be consulted by appointment in our Washington, D.C. Headquarters. Select holdings are available on microfilm at the Archives' offices in Washington, D.C. and at our New York Office. Copies of unrestricted microfilm materials can be obtained through one of our affiliated research centers.